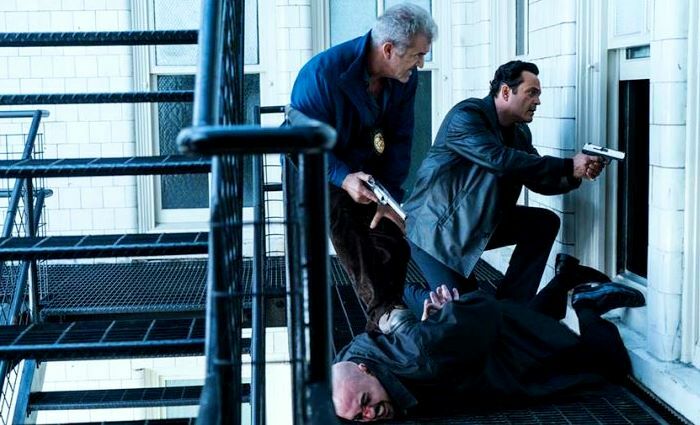 Mel Gibson and Vince Vaughn get meaty, Tarantino-esque dialogue to work with as a disgraced cop team in Dragged Across Concrete, a slow burn suspense flick that you will remember for a number of reasons. One, S. Craig Zahler flavorfully cooks up 1940’s B-movie noir dialogue updated with profanity-laced euphemisms of the now. Two, Zahler’s actions scenes are vicious but clean-cut with a certain respect to honest procedure. Oh, and these guys bend the rules because they don’t believe in contemporary PC if it means nabbing bad guys. A lot of PC rules are broken in this film. Much that is said is sexist and racist because these characters are sexist and racist, and at times self-derogatory about their own histories. That kind of modus operandi is what keeps them however from getting raises and promotions. In the stakeout scenes, Gibson’s Brett Ridgeman and Vaughn’s Anthony Lurasetti talk and talk, much longer than you see any cops talk in a cop movie. Often they are moody and growly with each other. Sometimes in a two-shot you will one of them munch on a sandwich while the other one just stares annoyed. Many movies would sink during such scenes for being too indie indulgent. From the beginning of Zahler’s career though, he has proven that you can listen to his characters endlessly and the power of his dialogue will draw you in, whether it’s right or wrong does not matter. It is distinctive. The violence too is distinctive. With the brutal “Bone Tomahawk” and the ultra-brutal “Brawl in Cell Block 99” (sorry, maybe the former is more brutal, it’s a tough call), Zahler has become one of the most underrated directors. I think “Cell Block 99” is the best B-movie of the decade, the most Tarantino-esque, a piece of sizzling exploitation that could have persuasively had Tarantino’s stamp on it had QT made it in 1993, between “Reservoir Dogs” and “Pulp Fiction.” I digress. We learn what haggard veteran Ridgeman and young and poor Lurasetti’s problems are at home. Basically, these are underpaid cops that convince themselves that they are deserving of a handout. The two trust each other and share a solidarity, so the two agree to bend the rules just once. They get a lead on a criminal named Vogelmann (Thomas Kretschmann) who is supposedly hiding a large sum of money in his apartment, and that it could get moved. If it is to be moved, it could be swiped, and Ridgeman and Lurasetti could get that bonus that feel they are owed. What this duo doesn’t know is that Vogelman is actively planning larcenous activity. At one point, Ridgeman and Lurasetti are spying while a crime is in progress. Whether they act on it or don’t act on it is part of the drama. The cops are off-duty and not supposed to be there. But as true men who care about civilians, they should call it in. What should they do? During the course of “Dragged Across Concrete,” Zahler cuts to other characters whom you don’t know how fit in. We meet Henry Johns (Tory Kittles), who is fresh out of prison only to walk in on his mom performing a seedy act while his son is locked away in his room. We meet Kelly Summer (Jennifer Carpenter), a straight-laced and ordinary gal, who we learn within minutes has been clinging onto her maternity leave because she both hates her job and loves her newborn so much. Sometimes such small players make their way into plots because they cause other peoples’ fates or are a part of tragic fate themselves. 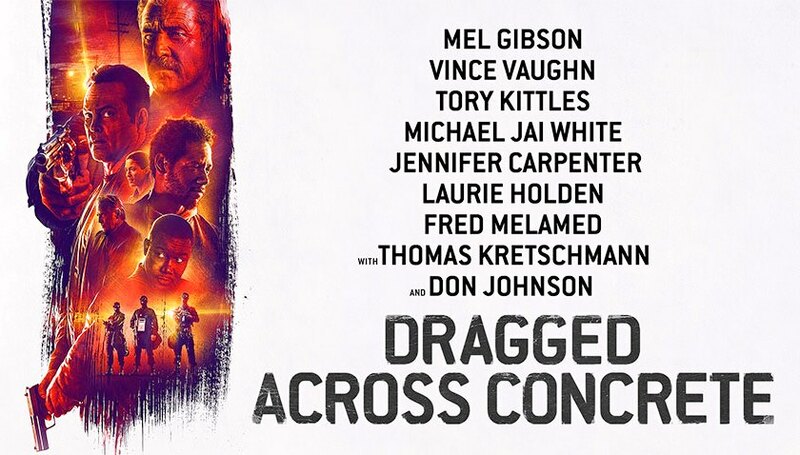 “Dragged Across Concrete,” as I’ve suggested, is a thriller that takes its’ time. Ordinary-seeming people with big mouths and a windy history get thrown into a compelling and violent scenario. If you’ve been a Zahler fan, it doesn’t match the shock and fury of his previous grindhouse extravaganza “Brawl in Cell Block 99,” but it’s another must see film of the Zahler-Is-The-Low-Budget-Answer-to-Tarantino canon. No other director in the last twenty-five years has delivered as successful a Tarantino homage as Zahler. Please, Zahler’s films hurt but you gotta love him. Don Johnson, Udo Kier, Fred Melamed and Michael Jai White also make impressive appearances. Film Cousins: “Brooklyn’s Finest” (2010); “2 Guns” (2013); “Bone Tomahawk” (2015); “Brawl in Cell Block 99” (2017).